We know you have given a cool mod for your Xbox 360 case, but you forgot one thing, the drab grey Xbox 360 hard disk drive case. 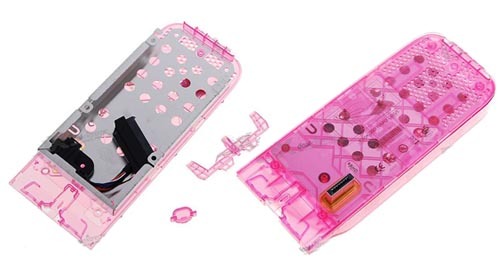 perhaps you could replace it with the colorful hdd hard disk drive case with LED circuit board. The Xbox 360 hdd hard disk drive case measures 7.48 x 3.11 x 0.91 inches and weights 7.23 oz. It is available in various brilliant colors, including translucent blue, translucent white, translucent yellow, and etc. Each plastic case comes with a circuit attached to many ultra bright LEDs, which can light up once touched by your finger. The Xbox 360 HDD case costs $18.91 USD. If needed, you can choose one from Dealextreme.